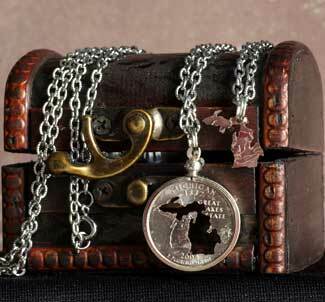 The Hand Carved Coins are all one-of-a-kind – each one is cut by hand and no two will be exactly the same! 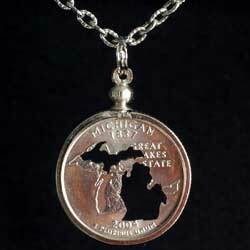 Each carved coin is cut out and then placed in a silver color bezel. 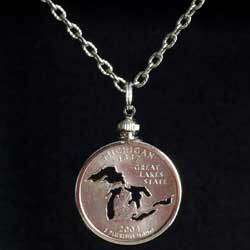 A 24″ silver plated oval textured link chain necklace is included with each carved coin. 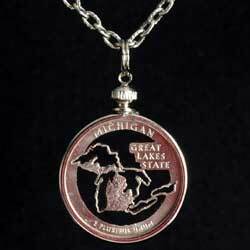 This is the perfect way to show off your Michigan pride! Although coin jewelry has likely been around since coins were first popular, it is thought that the Egyptians were the first to wear them as jewelry. The Egyptian soldiers would collect coins along their travels and turn them into wearable art. 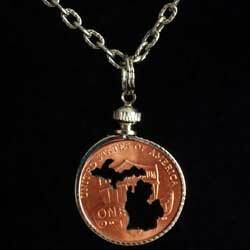 The “Love Token” began to appear in Great Britain during the late 1600’s through the 1700’s. 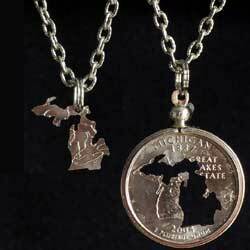 Most Love Tokes were coins that were smoothed by hand and then engraved with a special message. These tokens were used to celebrate a birth, a special date, initials or name of a lover or family member, or even as a remembrance of someone lost. Later versions included hobbies and favorite places or images. Love tokens became popular in the United States about the time of the Civil War when soldiers would collect coins and send them back to their family with special messages engraved or carved into them. The “rules” of Love Tokens are simple; they MUST be actual currency AND carved or engrave by hand. Although there has been some controversy over the legality of coin carving in the past, it is currently NOT against the law. It is similar to the coin imprinting machines you might see at the zoo or in amusement parks. As long as the coin altering is not done with intent to defraud anyone, it is NOT considered illegal defacement of currency – whew, that’s good news! Each coin is cut by hand, one at a time, so no two will be exactly the same. Carved Coins designs all templates to keep the designs very close, but no two will be identical.